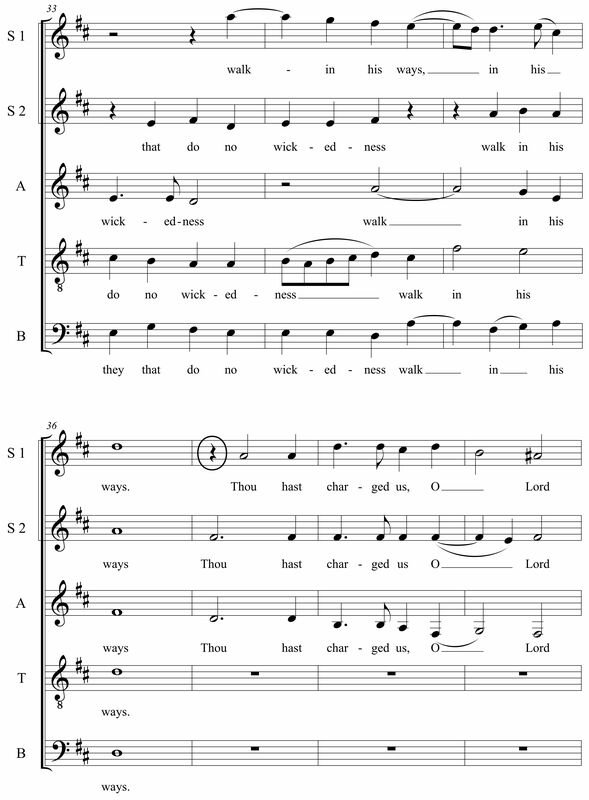 In more than one composition lesson in recent weeks, I have brought up the same passage from Thomas Tallis’s anthem “Blessed Are Those That Be Undefiled.” The discussion on each occasion related to rhythmic aspects in my students’ compositions. I was trying to get them to recognize that A) the rhythms they were writing were straightforward and therefore rather bland, and that B) it usually only takes the slightest of alterations in order to enhance the rhythmic vitality of such passages. So I turned to Tallis. The passage I referred them to (see below) is remarkable for the fact that the very slightest of rhythmic alterations—the adding of a single quarter rest before the first sopranos’ entry at measure 37—enhances the aural effect of the choir’s D major chord entry to a significant degree. Take a moment to listen to the excerpt a couple of times. I began thinking more about this little quarter rest and its dramatic aural effect. What does it add that would be absent if the first sopranos entered with the other voices? The delayed A adds buoyancy to the D major chord; it propels the music forward into weightless suspension, as a ski jumper is propelled into weightless flight (to use an analogy in the Winter Olympics spirit). But not only does the delayed A enhance the choir’s entry, the syncopation also enhances the arrival of the following downbeat, the moment with the music’s weightless flight is once again grounded, so to speak. The weightless suspension adds an element of drama and anticipation. To explain the cause of the effect in greater detail, the metrically displaced A, the fifth of the D major chord, enters on beat 2 of a 4/4 measure, creating a syncopation since beat 2 is considered a weak beat. Beats 1 and 3 are the strong beats, serving as a kind of metrical grounding. We call beat 1 the downbeat. And beat 3 really functions as a relatively weaker downbeat. By contrast, beats 2 and 4 are upbeats. Perhaps more than anything, this passage from Tallis tells us exactly why it is we talk about downbeats and upbeats, for the syncopated A certainly “lifts” the passage. One can easily imagine aurally a version of this choral entry where the A arrives on the downbeat with the other voices, and one can also easily imagine the lack of “lift” that would result in such a version. One can also imagine the lack of lift in a version in which the A is delayed until beat 3. However, does this simple rhythmic/metric consideration really do all the explaining of the delayed A’s aural effect? Or is there more to it? The more I pondered this little passage, the more I realized that there is more to it. For one thing, the A’s being the fifth of the chord and the highest note of the basic triadic construction in which the chord appears here certainly adds to the “lift” created by the metric displacement. It is difficult to imagine that the same amount of “lift” would be created if the second sopranos’ F# were delayed until beat 2 instead of the first sopranos’ A. The delayed A gives the chord a rising melodic profile—the A seemingly coming from the second sopranos’ F#. Furthermore, the delayed A adds dimension to the D major chord. The delayed A exposes the layers of an otherwise vertical block sonority, creating a kind of cross section of the chord. To use spatial language, it makes three-dimensional what would otherwise be two-dimensional. It also emphasizes and reminds us that even our simplest of harmonic units—the major triad—is created by the unification of diverse elements, three discrete tones. One of the most wonderful aspects of music is the unity-and-diversity combination that is demonstrated in ways that only music can. You might think of the fugue, or the operatic quartet, or the section of the symphony orchestra (or parts within each section). Or you might think of the most basic of harmonic units—the major triad. In all of these instances, the unified whole, though created by several or many parts, is more than simply the sum of its parts. Through a layering of musical materials in the way Tallis layers his D major chord, we more readily recognize this fact. And I do think listeners recognize this at least to some degree when hearing, if only on a subconscious level. For you Schumann fans, Schumann does a similar thing in the first song of his Liederkreis, Op.24 set. (You’ll have to find your own recording.) 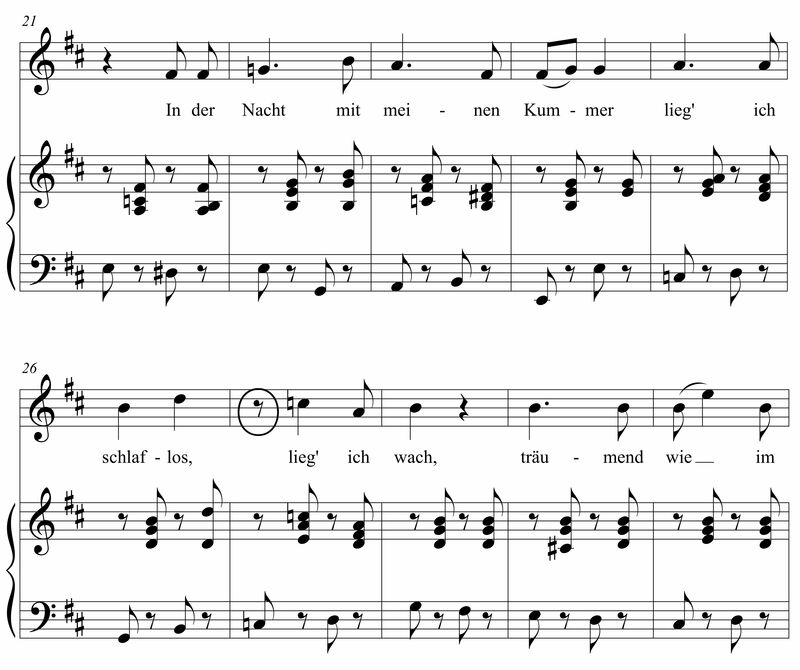 The inserted eighth rest before “lieg’ ich wach” in measure 27 is brilliantly placed. It’s the tiniest of details, but it’s these details that often transform a bland piece, even a good piece, into something really special. This entry was posted in Uncategorized and tagged Composition, pedagogy, schumann, tallis. Bookmark the permalink. Thanks for sharing this remarkable example and for your excellent rhythmic analysis. I have two other thoughts regarding this beautiful A – the other 3 voices are essentially moving in downward motion for three beats before it, so Tallis tricks us into thinking we are spiraling down, then things open right up on beat 4. Also, he’s saved this register by not using it, we are drawn to it when the sopranos enter. Last thought, I think this is about the upper limit for us to actually understand what the sopranos are saying when they sing – in other words, the last note where we can get a pure vowel… that’s part of the beauty too. Thanks again – it’s been far too long since I’ve heard some Tallis. Thanks for the well-thought comments, Ralph, and thanks for reading. It is quite amazing how something so simple can create remarkable results. I must disagree with Ralph, though. The ‘A’ in question is not avoided at all. In fact, the preceding two bars contain that ‘A’ in that specific register in S2. I also do not see the “spiraling down” effect that Ralph mentions. There is contrasting motion between the S1 and Alto part, but the S2 line remains stagnant, offering only harmonic “filler.” I think that Luke’s essential point is germane – it is important not to allow one’s musical material to stagnate with simple repetition. A simple, and slight alteration can give a fresh, and enlightening perspective when used thoughtfully. Beautiful and interesting. Listening to the audio, I found myself wanting to hear more of what came before, to hear how it got there. But regarding that A on beat two, it strikes me as an “echo” of two previous As, the first one being the glorious high A in S1 in the first measure shown, on beat four, and then the second one being in the alto in the next measure, on beat three (threatening a stretto?). After that, the A in question comes in on beat two, as a less intense “echo” of what happened before. Anyway that’s how I hear it. It sure is beautiful, whatever the explanation.